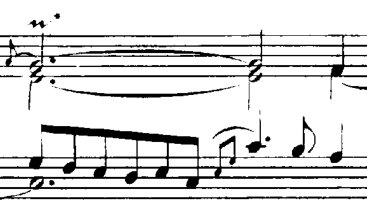 Inverted mordents and turns are frequently used in the prelude No.4 of J.S. Bach in C-sharp minor. In what follows I assume the key of the piece is known. My first question is related to the normal mordent that is placed on top of the E-G chord in the second bar (see image below). Does the mordent here only concern the upper note, namely the G? If yes, how is it played together with the E? If there was just the G note, then the mordented G is equivalent to: G-A-G. But given the additional E note that has to be played, my current take is that it should be played as: E-G chord played, followed by A-G while keeping the E held down. Is this correct? Similarly in the 11th bar, (with the difference of having inverted mordents), we have two chords mordented, but the sign being underneath the chords. The sign being placed underneath instead of on top, does it mean that the lower note is mordented? For example the A-sharp in the first chord (see image below), in which case we'd play A#-C chord followed by G-A#. Here is a transcription of Bach's own Table of Ornaments from the Klavierbüchlein vor Wilhelm Friedemann Bach. A PDF of the Klavierbüchlein ms is available on IMSLP here. (This Prelude is in the Klavierbüchlein, but completely devoid of ornamentation.) You may find the discussion here useful (a condensation of the subject as presented in Willard Palmer's edition). Your first example has two parts: an appoggiatura and a trill. An appoggiatura is not a grace note. In Baroque music, it is shorthand for a nonharmonic tone resolving by step into a tone of the harmony. All the commentators of the time (C. P. E. Bach, Marpurg, etc.) agree that an appoggiatura of a regular note value is played on the beat and takes a duration of half the written value. Most agree that an appoggiatura played against a dotted note takes 2/3 of the written duration, although there is a certain freedom allowable. In this particular case, anything from a crochet to a dotted minim should work pretty well. There is no such thing as a Baroque upper mordent, however: that's a later (19th century) ornament. C. P. E. Bach was vehement that trills always started on the upper auxiliary, and J.S. Bach's table certainly shows that kind of trill for this symbol. In a case like this, where the upper auxiliary repeats the appoggiatura, starting on the auxiliary would help keep the trill from sounding like a kind of Nachschlag of the appoggiatura. Note that the number of alternations in the trill is variable. Having said that, I have heard an effective rendition on harpsichord that used a crochet-length appoggiatura and started the trill on the main note, so you have some leeway in ornamenting the Prelude. The Prelude does exist in a number of manuscripts and underwent some changes along the way. Prelude 4 in the fair autograph of WTC I (P415, which Bach signed off with "SDG", Soli Deo gloria, at the end) is like the version in the Klavierbüchlein in being devoid of ornamentation. You can see it here at the Staatsbibliothek-Berlin (bottom half of the page). Ornamentation would have been added according to the conventions of the time. My understanding is that the written ornamentation was added at a later stage (not necessarily by Bach, but possibly definitive copies by students). The WTC went through a number of stages of revision after the autograph. The question can be vexed: here is some discussion of it, and the Preface to the Henle Urtext edition gives an idea of the development. I haven't got the Henle edition, so I can't say what they would show as definitive (and what in small notes and symbols) as a result of Heinemann's research. I'm not a Bach scholar, so I don't know where to track down all the sources, nor do I know their relative merits. For this, you can pick up your own Urtext or critical edition (usually a good idea), and work out for yourself what ornamentation is correct and/or effective. So... The takeaway here is that the appoggiatura is an emphasised non-harmonic tone played on the beat with a fairly substantial duration, and that the symbol over the main note is for a trill, not an upper mordent - Baroque mordents only used the lower auxiliary. Last, these ornaments were added in later copies of the WTC I manuscript that the editors of the Bach-Gesellschaft (whose edition you've got) considered authoritative. In your second example, yes, the mordents would apply to the alto voice. If both voices were affected, there would be mordent symbols both above and below the stave. 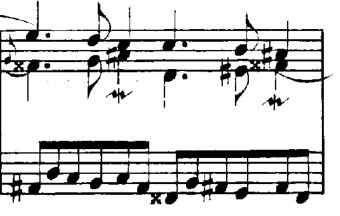 You would thus play the first instance as something like demisemiquavers A♯-G♯-dotted quaver A♯ (the rhythm in Bach's table) under the held C♯. Your ideas are basically correct, but the first example is a bit more complicated because of the appoggiatura A before the chord. So, the initial chord is E-A, and the question then is how long the A should be, before playing the mordent. I usually play the A as at least a quarter note long, so you get an anticipation in the left hand (C#/G#/A - C#/F#/A) and then a 6-4 5-3 progression (C#/F#/A - C#/E/G#) plus the mordent on the G# of the C#minor chord. Or, since these ornaments were meant to be a matter of taste rather than following strict rules, I might extend the appoggiatura A to be a dotted half note, and play the mordent as the end of arpeggio ornament on the next beat, i.e. make the arpeggio into 6-notes, E-G#-C#(LH)-G#-A#-G#(RH), or even 7 notes playing the tied E again, E-G#-C#-E-G#-A#-G#, or even really make a meal of the arpeggio and play E-G#-C#-D#-E-F#-G#-A#-G#. "It all depends on the mood I'm in...."
As I remember things from years ago, the mordent over a chord applies to the top note and under a chord to the bottom note (inverted mordent). Of course these names are reversed by some authors. In the cases you showed, I think your first idea is correct. You play a sustained (relatively) E and while holding the E, play G-A-G. Similarly for other cases. A quick check of Dolmetsch's book and Dart's book didn't discuss mordents over chords. I don't remember any multiple trills before Beethoven. Multiple trills are a succession of the same harmony and don't seem to fit Baroque sensibilities. Not the answer you're looking for? Browse other questions tagged theory piano notation ornaments or ask your own question. Two different approaches to the mordent in one piece in baroque? Does a chord imply a change in the key signature?